Direct Mail Marketing is an essential and invaluable tool when seeking to build and sustain profitable relationships with current and prospective customers. Whether you need to purchase a mailing list or utilize your own database, there are several creative ways Better Letter Mailing Services of Atlanta GA can add value to your mass mailings. While simultaneously boosting your sales and growing your business, reaching more customers with your message tailored to an audience targeted within a particular market niche will translate both qualitatively and quantitatively into increased revenue and brand loyalty. Direct mail is the easiest and most cost effective way to achieve such consistent and measurable success. Reactivating old accounts does not happen without persistent contact via direct mailing services to your list of customers. A successful direct mail campaign remains the method of choice for discerning entrepreneurs and businesses to stay in touch with current contacts and make new contacts. Combined with personalized follow up, direct mail is a critical step in the sales process for businesses of any size. The mailing of informational material can start generating new business contacts almost immediately. Also, announcing changes in your company’s organization, products, or services will initiate curiosity which could encourage prospects and existing customers to take action now rather than later. Educating customers and prospective customers with informational newsletters and brochures takes time, research, and professional expertise. Better Letter Mailing Services can help you achieve success in your marketing plan, and often help you even exceed projected sales and marketing goals. The ability to target a specific audience is perhaps the most attractive aspect of direct mail. Developing your brand, initiating or enhancing target market presence, and increasing sales profitability in the most cost effective manner are all within the realm of a successful direct mail company like Better Letter Mailing Services. In order to help you qualify for maximum postage discounts and quick delivery service, Better Letter presorts and pre-barcodes your mail while adhering very strictly to postal guidelines and regulations. Atlanta Direct Mail Services Better Letter’s mail piece design expertise is unmatched anywhere else in the Atlanta, GA area. Successful companies realize and exploit the fact that direct mail is one of the most cost effective method of sales promotion, community relations, and leveraging existing customer relationships. Organizations looking to strategically accelerate business growth, keep the attention of specific target markets, and consistently realize measurable results by using the services of Better Letter Mailing Services in Atlanta, GA. Outsourcing you mail work directly to our production facility located in Metro Atlanta takes the stress and the struggle our or creating a successful marketing plan. We can manage direct mail jobs from the largest to the smallest. Our investment in state of the art equipment makes certain that we can deliver on time and at a lower cost each and every time. It is more important than ever before to focus your campaign efforts on your target audience. As I’m sure you’re well aware, the only people can vote for you are the registered voters in your district. It is imperative that you get your name and your message in front of these key voters in the final weeks before the election. The overpowering advantages that direct mail has over other marketing mediums is that you can directly and specifically target your audience. The only people that can come out to the polls and vote for you are the registered voters in your district. With direct mail you can specifically target the registered voters in your party, and in your district, that voted in the last election. These are the voters that are most likely to come out and vote again. Also, direct mail allows you to send a specific message to a targeted group within your district, i.e. female voters, or newly registered voters, or any other demographic group of your choice. Direct mail makes it possible for you to spend your campaign budget targeting your specific message to that specific group. Why spend your precious advertising dollars sending your message out to people who don’t live in your district and who aren’t even registered to vote? Direct mail just makes the most sense. 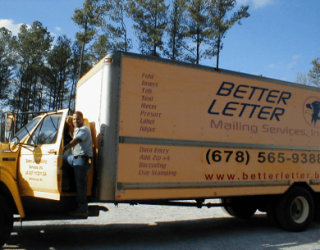 Better Letter is a full service print-to-mail production facility located right here in Atlanta GA. We serve the entire southeastern United States. We have over twenty years of experience in helping political candidates use direct mail to make their campaigns more efficient and more cost effective. Not only can we design and print your mail pieces for you, but we can also presort and pre-barcode your mass mailings for maximum postage discounts. Direct mail marketing is straightforward, effective, important, trackable marketing that enables companies and organizations to take their message straight to the customer. Businesses and organizations from the self employed handyman to fortune 500 firms use direct mail to reach their advertising objectives. Direct mail advertising and marketing support services are a tried and tested means to improve company. At Direct Mail Company Norcross GA Better Letter Mailing Services we can take your marketing concepts from start to shipping without the requirement for you to do any of the work. You could keep caring for your business and leave direct mail marketing to the experts at Better Letter. By utilizing dynamic & colorful designs and a strong call to action direct-mail advertising has been verified to increase company and has a significant perk of quantifiable, trackable responses from clients. A well established and targeted subscriber list could confirm to be a favorable return on your marketing investment by revealing simply the amount of customers reply to your particular telephone call to activity. Direct mail advertising and marketing campaigns can be customized to consumers based upon requirements such as location, income, age, career and as you will certainly view in our list types web page, certain targeted newsletter can be established for practically any type of geographical or demographic requirements you can dream up. It’s all about targeting! We supply a full range of campaign administration services in order to optimize the power of data. In today’s financial environment, firms need all the help they could acquire. Fortunately, innovation is on our side! Better Letter supplies Data Processing and Listing Administration services to maximize the power of your information. In addition, we’ll tailor our QR Codes and Direct Mail Marketing services to satisfy your exact necessities. Here at Better Letter Direct Mail Advertising, we’ll help you target your audience with mix of solutions, then adhere to in-depth tracking every step of the method. With our expert, effective advertising and marketing options, you will certainly get the results you have actually come to expect. Use the web links over to read more concerning our Advertising and marketing Solutions. Here at Better Letter Direct Mail Marketing, we’ll aid you target your audience with combination of services, then adhere to up with comprehensive tracking every step of the method. With our expert, efficient advertising and marketing remedies, you will acquire the results you’ve come to expect. When conducting direct mail marketing there is one sure way to fail, just fail to “ask”. In all the details of the marketing campaign from cost, design, printing and mailing it is easy to overlook one very important factor. Have you ever received an advertisement or read an article that was very convincing? It caught your attention with a dynamic design. It conveyed good information about a product or service. However, you simply discarded the advertisement and went on to the next thing that got your attention. What happened? You were not asked to do anything, so you did nothing. It is important to give a strong call to action in any advertisement. Sometimes the call can be simple phrases like “Call Now” or “Buy Now”. Some others start out by giving subtle hints in the copy of the mail piece. Like, “check out our website” or “get a copy of our catalog”. By the end of the sales pitch however, the call to action must be strong in order to help people decide to purchase your product or service. One of the reasons a call to action is so effective, is that consumers rely heavily upon what others tell them and respond to those suggestions. Position yourself to be one of those influences. Of course consciously, they would never rely on the sales piece to help them make that decision, however sub consciously that little bit of direction will spur them to take the next step. To help understand the process lets break the steps to a converted sale down a little further. The consumer’s attention is caught by the mail piece. Perhaps it is the colors or pictures on the advertisement, or maybe it is a subject in which the consumer is interested. The consumer reads over the advertisement and is convinced how the product or service will be beneficial. A clear, simple call to action is given. The consumer sees the call and realizes that in order to enjoy the benefits the action must be taken. The consumer completes the action resulting in a sale or lead for your company. It doesn’t matter if the color scheme and design of your mail piece is perfect and you outline the benefits of your product masterfully, if you do not give a call to action the process will be incomplete and you will not make the sale. So if you want to make the most of your direct mail marketing, make sure you ask your potential customers for it specifically, over and over again. Direct mail advertising is by far the most cost efficient method of getting your business in front of people to generate interest in your product or service. As opposed to other forms of advertising such as the yellow pages, you can actually generate new customers who have never even heard of your product or service before. I know what your thinking, I already know what my product is. Well that’s great, but are you able to articulate your service or product in one sentence. Perhaps your business has several different offerings and micro-marketing would be more effective. For example, “I help people save money with energy efficient windows” is much more specific and effective than “I do home improvements”. It is a good idea to micro-market your services in a mailer, so pick one service you offer and stick to it. Once you get the customer, you can always up sale them on your other services. This is something we harp on constantly, but if you are targeting the wrong audience, you are not going to get a good response. Pay attention to the personalities of individuals you do business with. What is their background and culture? Create a profile of your customer so you know who you need to target with your Atlanta direct mail advertising. What is the greatest benefit offered to the person who buys your product. People want to know the benefit of your product or service, not just the features. If you can show them that their life will improve in some way, they will be more apt to buy. If all you do is list your features and do not show the benefits of the features, you will not have a successful Atlanta direct mail campaign. Would a five page personalized letter sent be more effective than a simple postcard. Based upon the “Who” and the “Why”, what will peak your potential customer’s interest while building trust. Of course other factors come into play such as budget, but it is definitely worth your time to figure out how you are going to impact them. Do they live in million dollar suburbs or do the live in midtown? You need to find out, because birds of a feather flock together. If you have customers concentrated in an area, you know that people in that area are interested in your product. So find out where that is. You can also simply break it down by income. Mailing services can help you with this or you can visit your tax assessors’ county website. It is best to start getting your name in front of your customers a couple of months before you hit the big season. For example, if you install swimming pools, send out two mailers in January, February and March. That will put you in front of your potential customer six times before the main season hits. In April, send out a mailer every week and you will see a big bang because the potential customers will remember your name and already be comfortable with your business. Atlanta Direct Mail Advertising is an effective way to get your name out there and drum up some business, even when other companies are struggling. As long as you do your homework, you should get some great results. Happy Hunting! CNN just keeps pounding away. Again and again, the big “R” word, Recession. Experts pose the question “Are we entering a depression?”, and other experts answer the question with full certainty. All the time, their viewers grow more and more anxious. In the end, people’s fears and anxiety and the constant news cycle almost make the downward trend inevitable, a self fulfilling prophesy. I am not picking on CNN, all the news channels do it. And while they are stirring people’s fears, they are also capitalizing on the situation with huge advertising dollars. Make an honest assessment of your business. Take everything into account. Your budget, what projects or sales you actually have on your books and which ones you can honestly count on. What was last years sales for the first quarter? This is all information that you need to use to help you determine your projected sales. Create a spreadsheet and compare the numbers. Project what your first quarter revenue is going to be. Is it going to be higher or lower than last years? If it is going to be lower, you need to find a way to make up the difference by either cutting your budget or upping your marketing. When tightening your belt, its best to cut from the support area. That is why you will see retail corporations cut corporate jobs before they cut store jobs. Why? Because the store jobs generate the revenue. Without the revenue the business ceases to exist. I hate firing somebody as much as the next guy (although some of us seem to enjoy it, i.e. Donald Trump). But sometimes you have to shed some weight so that the whole business does not close and everyone, including you, lose their income. Is a new computer a reasonable expense? Is it a necessity? Will having it increase your sales? If so, buy it, otherwise wait for a strong profit before making the purchase. If your business is struggling, you have to have only essential personnel, stock and equipment. You can run the business on a skeletal structure. It may mean longer hours for you, but do not worry, it is not going to be long term. Many business owners are tempted to cut marketing budgets in lean times instead of cutting back on other expenses. Its easier not to buy that ad or send out that mailing than let an employee go. However, in a lean economic time, it is imperative that your marketing budget grow, not shrink. If you do not have customers, you will not survive. The only way to get customers is to make sales. The only way to make sales is to have leads or in store walk ins for retail locations. If the market has shrunk, you need more of the market share in order to survive, and dare I say it, prosper. The depression is famous for many things. Mainly, depression, fear, soup lines, and unemployment. But there is another little known fact about the depression that should be touted. More millionaires were made in that time period than any other time period in our nation’s history. That includes the tech boom and dot com era. During the depression, there were men and women who were not faint hearted who laid it all on the line and went for it, they pursued their dreams when many people were just sitting around feeling sorry for themselves waiting for the government to “bail” them out. They realized that as big business and small business alike faltered, opportunity was born. They went for it in the midst of the tragedy and it paid off huge dividends for them, their families and all the people they employed. If you are facing a downward turn in your business, remember that your competitors are too. Businesses will close. People will be laid off, but at the end of the day someone is going to come out of the fray on top, and it minds well be you. According to a recent survey, 77% of consumers who were not already customers were driven online to complete online credit applications by direct mail advertisements. Credit card companies have massive marketing budgets and could focus all of their energies on T.V. and radio advertisements. However, they have discovered that relentless direct mail marketing is the most effective strategy for reaching new customers. Credit card companies know that direct mail gives them the ability to reach a very specific demographic of the population at minimum price. For example, credit card companies know that a college student is very likely to act upon an offer for a credit card. As soon as a student graduates high school, that student starts receiving direct mail credit card offers. And usually, within months most students have acted upon those offers. Your red golf widgets are expensive and your customers are typically men between the ages of 30 and 45. You also know that most of your customers have an annual salary greater than $75,000 per year. You know that your customers probably live in houses with values greater than $190,000. You also know that if you canvas a neighborhood that is located on a golf course, you are going to have a greater chance of reaching customers who play golf. How many direct mail pieces are you going to send out and when? When selling a more expensive item or service, the amount of time it takes to complete a sale increases. This means, that a customer is less likely to respond the first time they see an advertisement. The most effective strategy for red golf widgets is to send out direct mail pieces to a smaller geographic region five times. Some companies may decide to send out one mailer to a larger audience. However, the more times a customer sees a business advertisement, the more likely they are to try the product or service. Its time to develop your fliers and have them printed. Most printing houses have in house designers that can assist you in designing your mailing piece for your target audience. After the design, the print shop will print the mail pieces. If you are unsure of where a good print shop is located, you can contact Better Letter for a referral to a print shop the Better Letter team has worked with in your area. After having your mailing piece printed, the next step is to have your mailing handled by a mailing house. A mailing house handles the addressing and sending of the actual mail pieces. By having just one address, the mailing house can send the mailer to the surrounding area. Simply give the mail house an address of one of your customers located on the golf course and the mail house will take care of the rest. Postage is expensive these days. And if you were to send out direct mail at full price, the cost would be astronomical. This is where Better Letter comes into play. Due to the volume of Better Letter’s mailings, Better Letter gets extremely discounted mailing rates. Better Letter is able to pick up your printed direct mail pieces anywhere in the Atlanta area. Would you like more information about our Atlanta direct mail service? Direct mail marketing can be a very effective technique for gaining new sales, whether from new or current customers. It has been the preferred method of advertising for many large companies, and that is not going to change anytime soon. By knowing who your target market is and just targeting them, you can increase your success rate dramatically. If you send out 10,000 advertisements for a retirement village and 5,000 of them go to twenty somethings, your success rate is going to be very low. Contrarily, if you send them to people 60 and over, your success rate is going to be astronomical. It is important to remember that the most effective direct mail campaigns, are just that, campaigns. The more times a consumer sees your service or product, the more likely they are going to convert into one of your customers. A one time shot in the dark mailer is simply not going to be effective. Go ahead and plan on doing more than one mailing to see the best results. Determine how much budget you have for this project and prepare accordingly. For example, if you have the budget for a 10,000 piece mailing, break those up into five different mailings of 2,500 pieces. This will be much more effective in the long run, cost less up front, and return high dividends. Especially if you pay attention to tip 1. Print houses make money based on the amount of printing that they do, so they will encourage you to print large fliers and advertisements. However, in many cases, it may be more beneficial to print postcards and hit a larger target audience. If you are planning on sending out 6 mailings, start with postcards for the first 3. As your revenue increases, you could easily create a larger mailing piece for the last 3 mailings. Graphic artists are great, but you should never substitute the substance of your advertising message for style. Substance is what sells. The substance of a message: “We have the largest selection of wedding dresses in Atlanta at the best price” carries more weight than just some nice graphics of a wedding dress. Ultimately, you want to give your substance with style. The advertisement should catch someones attention, but the message should stick with them. The only exception to this rule is if you are selling style. For example, an advertisement for a graphic artist better be top notch graphics, because the graphics are the message. Overall, if you take the time to research your project and plan out your marketing strategy you will most likely be successful. When contracting out printing services it is important to do research. Doing research up front can help you make your direct mail campaign profitable with as few headaches as possible. We have put together a list of questions you may want to answer before going to the printer. This is an extremely important question because it helps you answer all of the other questions. Take a sampling of your customers. Identify their gender, race, economic status and as much other information as possible. Take that information and see what your customers have in common. Once you see what the most common factor is, find the second and the third. Than conduct your direct mail campaign to that specific group. For example, you may find that your average customer is female, older than 40 and live in homes over $200,000. It is much easier to develop a strategy that is effective for that group than a strategy that is effective for everyone. 2. Based on your target market, at what quality should you print? If you are targeting high end businesses and your flier looks low end, you may not get as many responses as you planned. On the other hand, the expense of high end mail pieces may not be justified if you are targeting lower income individuals. Color or “Black and White” Printing: If you are focused on a high end clients who may spend thousands of dollars with your business you may want to use color because it gives a high level of professionalism. On the other hand, if your customers don’t spend thousands with your business and you depend on mass sales, it may be a better option to use black and white so the cost doesn’t eat up your profits. DPI: Or dots per inch, is a measurement of printing quality. The higher the DPI the better the quality. When getting quotes always ask about DPI, because although some quotes may seem similar, they may be at ver different DPI’s. 3. How much should you spend on printing? There are often hidden charges in direct mail campaigns. They are not really hidden, they are just not often thought about. For example, letter addressing. Once you have a flier, you will have to address and send it. Depending on your situation it may be better to lower your printing cost and spend more of your budget on actually mailing the flier. On the other hand, it may be more appropriate to have a super nice mail piece and mail it out to individuals who earn more than $200,000 per year in your area. If you are in need of printing servces, you can contact Better Letter and we can assist you with your printing needs.